The age old debate over the benefits of an odexed or deodexed ROM is one that will continue to divide Android users. And at the end of the day, it comes down to a case of horses for courses. Some may prefer the ease of customization that is offered by deodexing, while others will no doubt prefer the overall feeling of speed and responsiveness that comes with an odexed ROM. Thankfully, there are plenty of options out there for anyone looking to dabble in this process. 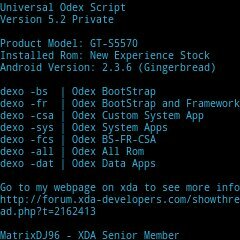 One such option for those looking to odex a firmware comes courtesy of XDA Senior Member MatrixDJ96 in the form of his Universal Odex Script. The main benefit of this particular option is that it allows the user to odex their current ROM directly from the device by running the script from a terminal emulator. Once you have installed the script by flashing via either ClockworkMod recovery or TWRP (other recoveries are currently unsupported), simply execute the appropriate command from the terminal to view the available options for your device. Whether you’re looking to “odex all the things” or just a specific part of your current ROM, the Universal Odex Script should allow you to do this quickly and easily. Just make sure to free up the internal storage space you will need on hand to complete the process. Thorough instructions on how to use the script can be found in the original thread.